In Arizona, New Mexico and many parts of Texas, pine trees are native. 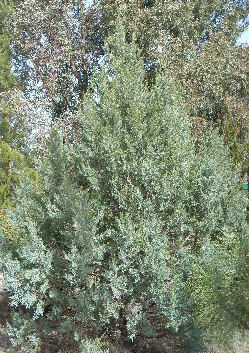 We carry unusual Pine Trees such as Aleppo Pine, Italian Stone Pine, Elderica Pine, Cluster Pine and Mexican Pinyon Pine. There are many other native trees that we carry. The Mexican Plum is an extremely drought tolerant tree which can grow to be 15' tall with a very interesting bark and beautiful white sweet flower blossom in the early Spring. (In Central Texas it typically blooms in early February after a brief warm spell.) Anacacho Orchid Tree (Bauhinia congesta) is another early Spring flowering (commonly fragrant white flowers with a strong perfume scent) that grows nicely in the shade of a larger Oak tree. Eve's Necklace is an usual tree that grows in the shade of a larger tree or in full sun. They also bloom in the Spring although it is late Spring. By late summer their black seed pods dangle off of the tree. There are a variety of nut producing trees that grow in Arizona, New Mexico and Texas several of which are native to the area and very drought tolerant. . Nut producing trees include: (a) Arizona Black Walnut (Juglans major), (b) Texas Black Walnut (Juglans microcarpa), (c) Black Walnut (Juglans nigra), (d) Russian Walnut, (e) Cascade Walnut, (f) Chinese Pistachio and (g) Pecan. The Mexican Buckeye of all of these trees is the most drought tolerant and has bright-pink, fragrant flowers that appear in early summer or sometimes after heavy rains. It is more commonly found in the southern U.S. I have seen many plants as a part of a Mall's landscape. The Texas Persimmon is a Texas Native tree that grows in either full sun or part shade as a shrub or small tree. It produces black berries that are edible when fully ripe; the berries can be tart. Eating them really can stain your hands! Birds love these large berries. We have begun carrying a host of other types of trees well suited to the more arid environments of Arizona and New Mexico and the hot and humid environments of Texas. These drought tolerant trees have survived well in cold temperatures as well in the heat of summer. The Big Tooth Maple can be found throughout many areas of Texas, New Mexico and other southern states along rocky embankments and dry creek beds. The Desert Willow is a very popular tree that is used today in many landscaping environments for the home and the commercial office or retail space. They are small shrubs that require little maintenance and produce flowering blooms during the summer. The Golden Ball Lead Tree is an excellent tree for small garden areas. Once established, it will produce multiple yellow ball shaped blooms in the spring. The lovely lacy shaped leaves make a wonderful addition to any garden.